As infrequent archaeological excavations have slowly revealed pieces of Burma's past, a better but still incomplete understanding of Burma's prehistory has slowly emerged. Scant archaeological evidence suggests that cultures existed in Burma as early as 11,000 BC, long before the more recent Burmese migrations that occurred after the 8th century AD. The conventional western divisions of prehistory into the Old Stone Age, New Stone Age and the Iron or Metal Age are difficult to apply in Burma because there is considerable overlap between these periods. In Burma, most indications of early settlement have been found in the central dry zone, where scattered sites appear in close proximity to the Irrawaddy River. Surprisingly, the artifacts from these early cultures resemble those from neighboring areas in Southeast Asia as well as India. Although these sites are situated in fertile areas, archaeological evidence indicates that these early people were not yet familiar with agricultural methods. The Anyathian, Burma's Stone Age, existed at a time thought to parallel the lower and middle Paleolithic in Europe. At least six kinds of stone hand tools have been discovered in the fourteen sites associated with this period. This assemblage of stone tools in conjunction with additional archaeological evidence indicates that these people lived by hunting animals and gathering wild fruits, vegetables and root crops. The Neolithic or New Stone Age, when plants and animals were first domesticated and polished stone tools appeared, is evidenced in Burma by three caves located near Taunggyi at the edge of the Shan plateau that are dated to 10000 to 6000 BC. The most complex of these, the Padhalin cave, contains wall paintings of animals, not unlike those found in the Neolithic caves at Altimira, Spain or Lascaux, France. These paintings may be interpreted as an indication that the cave was used as a site for religious ritual. 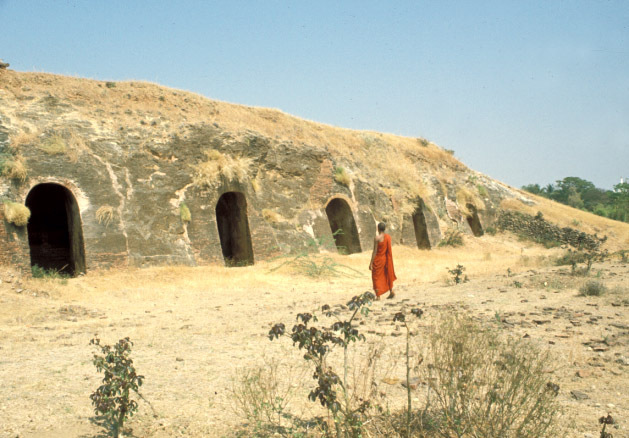 Thus, caves were among the earliest sites used for Buddhist worship in Burma. This is of importance because the use of caves for religious purposes continued into later periods and may be seen as a "bridge" between the earlier non-Burmese, Animist period and the later Buddhist period. 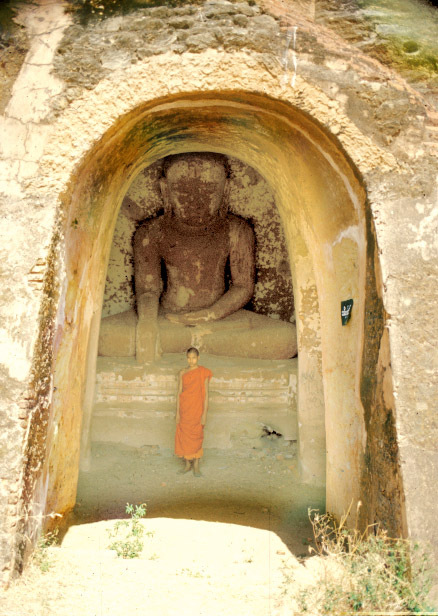 Numerous caves around the ancient city of Pagan have been outfitted with Buddha images or have been incorporated into early temples such as Kyauk Ku Umin or Thamiwhet and Hmyatha Umin. A Buddhist temple is referred to as a cave, whether it is naturally formed or, as is most often the case, architecturally constructed. The Burmese word for cave is "gu" and has been continually used to refer to Buddhist temples. It is frequently incorporated into the name of a temple, for example Shwe Gu Kyi or Penatha Gu. Also, until the twelfth century, temple interiors were intentionally dimly lit. This effect was achieved by installing permanent stone or brick lattices in all the relatively small windows. (The Burmese ethnic group has been credited with building their temples with larger, unobstructed windows and thereby creating more brightly-lit interiors - a transition that is seen in the temples of the Pagan Period). 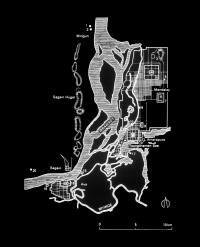 By the second half of the first millennium BC a new developmental phase began in the dry zone of Burma. Referred to as the early Bronze - Iron Age, these cultures shared practices and methods of production with various neighboring areas. Burial methods resemble those of Thailand and Cambodia. Iron working technology most likely came from India or other parts of Southeast Asia, and ceramic forms and decoration correspond to those of the bronze - iron Age levels at Ban Chiang in northern Thailand and at Samrong Sen in Cambodia. Numerous beads have been recovered that stylistically resemble those imported from Andrha Pradesh and Tamil Nadu in India. 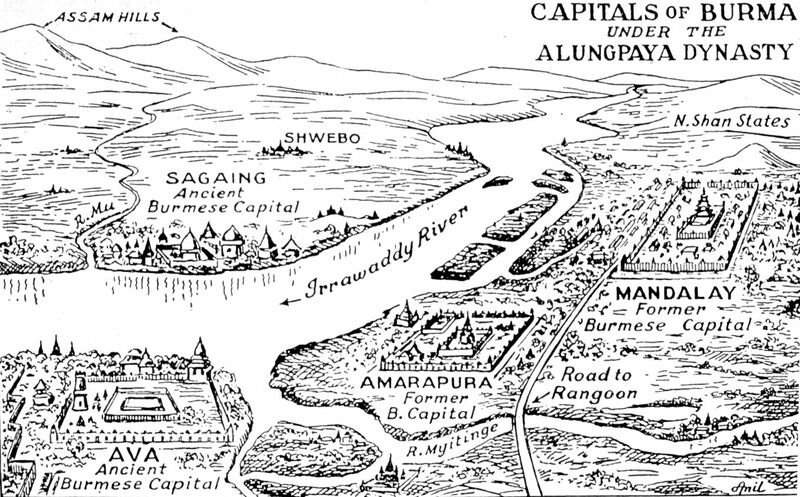 The site of Taungthaman is located near the 19th century city of Mandalay, on an alluvial terrace of the Irrawaddy River within the walls of the 18th century capital, Amarapura, and was occupied from the late Neolithic through the early iron age, around the middle of the first millennium BC. Many artifacts have been uncovered at Taungthaman such as sophisticated stone tools, intricate ceramic wares, and primitive iron metallurgy. Many of these objects would have been acquired from the prosperity gained through industrious farming and trade. When burying their dead, their new affluence encouraged these people to include among the grave goods fine decorative ceramics produced by specialized potter artisans as well as the more common household objects such as bowls and spoons. Human and animal figures discovered at Taungthaman in the 1970's are thought to have been used for religious practices. If this is so, these artifacts represent the oldest of their kind found in Burma. Although no building in permanent material was discovered at Taungthaman, the excavations uncovered a pattern of post-holes that are the results of buildings having been supported on wooden pilings. From the limited information available at present, the evolution of these early prehistoric cultures into the later Mon and Pyu societies is not well understood, although the late Iron Age coincided with the rise of Pyu culture and the creation of the first cities in Burma. However, there is ample evidence that by the fifth century AD, the Mon as well as the Pyu peoples had adopted the Indianized cultural life then widely practiced throughout mainland Southeast Asia which included elements of both Hinduism (Brahamanism) as well as aspects of Theravada, Mahayana, and Tantric Buddhism. 'The "Neolithic Culture of the Padah-lin Caves", Asian Perspectives, 14 (1971), pp. 123-133. Ba Maw, "Research on Early Man in Myanmar", Myanmar Historical Research Journal, no.1 (November 1995), pp. 213-220. Bob Hudson, "The Nyaungyan 'Goddesses': Some Unusual Bronze Grave Goods from Upper Burma", TAASA Review, vol 10, no 2 (June 2002), pp. 4 �7. William Solheim, "New Light on a Forgotten Past", National Geographic, vol 139, No. 3 (March 1971), pp. 330-339. Animism is a generic term used to describe the myriad religious beliefs and practices that have been utilized in small-scale human societies since the beginning of the prehistoric era and is the earliest identifiable form of religion found in Burma. This is not an unexpected occurrence because animist beliefs and practices have been found among early human societies in almost every country of the world. Animism is a belief that spirits exist and may live in all things, sentient and non-sentient. The world is thought to be animated by all sorts of spirits that may intervene negatively or positively in the affairs of men. Although spirits may live in all things, every object does not harbor a spirit. If there were a spirit in everything, the daily activities of mankind would be seriously disrupted because a spirit would have to be addressed or placated at every step in a day's activities. Spirits by their very nature are thought to be normally invisible and to assume visible form only on rare occasion. Therefore, it is a challenge for anyone to contact a specific spirit and be absolutely sure that the correct spirit was contacted and was present. Therefore, throughout the world, spirits are often assigned a contact point where they may be enticed for consultation. Salient features of the landscape often become the "home" of a spirit by assignment. Spirits are thought to live, for example, on the highest peak in a mountain range or at the odd bend in the creek but not in every stone or drop of water. If a landscape is devoid of a salient feature, such as is the case with a flat rice field, one is created by assignment such as building a simple shrine in the northeast corner of the field. That the spirits have a recognized "home" is important since the relevant spirit or spirits must be located and consulted before important decisions are made or an activity undertaken. Location as well as "presence" is of vital importance in animism because the spirit must be agreeably enticed to the location so that the request will meet with a positive response. A home or locus for consulting ancestor spirits is often created in animist societies by carving a generic but gendered human image and wrapping it in a garment or with possessions identified with the deceased. Gifts of all kinds, often of luxury goods, are ritually presented to the image when it may be wrapped in any of the deceased individual's possessions. In virtually all societies that practice animism, there are three broad categories of spirits: Spirits of the Ancestors, Spirits of the Locale or Environment (often referred to as genie of the soil) and Spirits of Nature or Natural Phenomenon. Those individuals who were important in this life, such as patriarchs, matriarchs, clan leaders, political leaders, or chiefs, are honored after their death because it is believed that if they were powerful in this life then they will be powerful in the afterlife and consequently they should be consulted. Security for the living is achieved and maintained by consulting these important ancestor spirits to receive advice on major decisions and assistance to bring them to fruition. Spirits of the locale or environment include, for example, the spirit of the mountain, the waterfall, the great tree or of each plot of land. In inhabited areas in Burma and especially within villages or towns, almost every large tree has a spirit shelf on which food and drink is placed to please the spirit and thus assure its blessings. The small wayside shrines, typically containing no images that are found along thoroughfares as well as in remote locations throughout Burma are dedicated to the spirit(s) of that area, that tract of land or that city plot. The Spirits of Natural Phenomenon are consulted as needed. These include the sun, moon, storms, hurricanes, typhoons, winds and earthquakes. These spirits represent the uncertainty of the world; that which is beyond the understanding and complete control of the living. Animism is typically practiced through rituals that are performed by a specially trained practitioner who serves as an intermediary between a person or group and the spirit to be consulted. The term shaman - the word used for such an individual in tribes living along the American Northwest Coast - is today widely employed by academics to identify such individuals wherever they appear in the world. This practitioner is called to perform a ritual at an auspicious location in which he entices the appropriate spirit or spirits to appear and cooperate by flatteringly calling them by name, performing their favorite music or songs, recounting their good deeds and offering them the things that they enjoyed when alive, such as food, drink (frequently alcohol), or things that have an appealing fragrance such as flowers or incense. These "objects of enticement" are considered by outsiders to be the Arts of Animism. Since animist rituals often do not require an image, these arts frequently consist of the objects used for enticement such as fine textiles, fine basketry or fine ceramics. Typically these items are the best available, expensive, newly made for the ceremony, or at least refurbished since it would be offensive to offer old clothing or stale food to a respected individual. Once the shaman is convinced the desired spirit is present and in an agreeable mood, he goes into trance and consults with the spirit concerning the critical matter at hand. He then comes out of trance and shares the wishes of the spirit(s) with his client(s). There are typically three categories of questions that are asked: those that involve the security of the group or person; the fertility of humans, livestock and crops; and the health of the group or the individual. All three categories of questions have to do with everyday life, the here and now, and unlike the "Great Religions", little attention is focused on the afterlife. The practitioners of animism, the shaman or mediums, do not belong to an organized clergy but, instead, learn the rituals and the practices of animism by having been an apprentice or an acolyte to another shaman. The specialized task of the shaman requires them to communicate with spirits, whether male or female, while in a trance. Consequently, an individual of ambiguous gender is well suited to speak intimately with spirits of either gender. Therefore, shaman tends to be either effeminate males or masculine females who at their will are capable of going into trance. In Burma, animism has developed into the cult of the Thirty-Seven Nats or spirits. Its spirit practitioners, known as nat ka daws, are almost always of ambiguous gender, and are thought to be married to a particular spirit or nat. Despite their physical appearance and costume, however, they may be heterosexual with a wife and family, heterosexual transvestites, or homosexual. Being a shaman is most often a well-respected profession because the shaman performs the functions of both a doctor and a minister, is often paid in gold or cash, and is often unmarried with the time and money to care for their aging parents. Shamans who combine their profession with prostitution lose the respect of their clients - a universal conflict and outcome. The reputation of Burmese nat-ka-daws has been generally damaged by this conflict. Animism, a generic term for the Small Religions, is a substratum of beliefs out of which the Great Religions have developed. It is a useful term to describe all of the small religions that vary greatly in the specifics of their practice. However, there are general characteristics that are easily recognized. Since animism is based upon the worship of individuals who once lived in addition to spirits that dwell in specific environmental locations, there are a myriad number of spirits. These spirits change in name and function in different physical environments. Consequently, the names of the spirits change from valley to valley, from one village to another or from one small group to the next. The worship of numerous spirits differs markedly from the great religions, which usually have one all encompassing god or a limited pantheon of gods. By comparison, in Burma and Thailand there is a spirit attached to every parcel of land. Since Animism is typically practiced by non-literate groups of people, a written record of their theology or literature doesn't exist. Practices or beliefs are passed down orally from shaman to apprentice. Since it is important for the shaman to preserve the correct order in which chants and genealogies must be recited, shaman in several societies have independently invented what scholars have come to refer to as "memory boards". These are boards on which there are a series of symbols or marks that assist in proper recollection and recitation. These boards have been found in many small-scale societies including those in Southeast Asia, particularly in Borneo and as far away as Easter Island. These boards, although often undecipherable to the uninitiated, are important because they are examples of the first form of writing. Art objects used in animism are typically made of perishable materials. The images are often of wood, cane, feathers, leather, and other materials such as unfired clay that easily disintegrate. Due to humidity, bacteria, and the foraging of animals and insects, these art forms do not last for long periods. Art forms made of perishable materials are suitable for animist ritual since the animist aesthetic places importance on the new and beautiful because the end goal is to please and attract the spirits. The sentiment here is that attractive gifts should be new and not secondhand. Therefore, old images that have been used previously are frequently repainted, re-dressed or made anew. At times, the "art objects" are discarded after a ritual since the objects have served their purpose of attracting the spirit and the spirit by its very nature of being a spirit can not take the objects away. Animist art obects are created in almost any form. The images may be anthropomorphic, or just an uncut slab of rock. The object may be adorned or unadorned. In Burma, the major Animist spirits were transformed into the Pantheon of the 37 Nats during the Pagan Period. The earliest known images of the brother and sister nats, Min Mahagiri and his Sister, who lead the pantheon, were painted on two planks hewn from a their sacred tree that had been thrown into the Irrawaddy and had floated down the Irrawaddy to Pagan. The use and manufacture of bronze drums is the oldest continuous art tradition in Southeast Asia. It began some time before the 6th century BC in northern Vietnam and later spread to other areas such as Burma, Thailand, Indonesia and China. The Karen adopted the use of bronze drums at some time prior to their 8th century migration from Yunnan into Burma where they settled and continue to live in the low mountains along the Burma - Thailand border. During a long period of adoption and transfer, the drum type was progressively altered from that found in northern Vietnam (Dong Son or Heger Type I) to produce a separate Karen type (Heger Type III). In 1904, Franz Heger developed a categorization for the four types of bronze drums found in Southeast Asia that is still in use today. The vibrating tympanum is made of bronze and is cast as a continuous piece with the cylinder. Distinguishing features of the Karen type include a less bulbous cylinder so that the cylinder profile is continuous rather than being divided into three distinct parts. Type III has a markedly protruding lip, unlike the earlier Dong Son drums. The decoration of the tympanum continues the tradition of the Dong Son drums in having a star shaped motif at its center with concentric circles of small, two-dimensional motifs extending to the outer perimeter. In Burma the drums are known as frog drums (pha-si), after the images of frogs that invariably appear at four equidistant points around the circumference of the tympanum. A Karen innovation was the addition of three-dimensional figures to one side of the cylinder so that insects and animals, but never humans, are often represented descending the trunk of a stylized tree. Detail showing a complex arrangement of snails, elephants, trees squirrels and other animals. The frogs on the tympanum vary from one to three and, when appearing in multiples, are stacked atop each other. The number of frogs in each stack on the tympanum usually corresponds to the number of figures on the cylinder such as elephants or snails. The numerous changes of motif in the two- and three-dimensional ornamentation of the drums have been used to establish a relative chronology for the development of the Karen drum type over approximately one thousand years. The Karens speak several languages that linguists have had difficulty classifying. Karen groups often speak different languages, some of which are not mutually intelligible. Hence, the Karen peoples are an exception to the basic assumption that an ethnic group can be defined by the fact that all its members can converse in a single tongue. There are at least three major cultural and linguistic divisions among the Karen: the Karreni or the Red Karen, who cast the bronze drums, the Pwo Karen, and the Sgaw Karen, as well as a number of other splinter groups who have scattered into the mountains below the Shan Plateau. These hillside people practice swidden or slash-and-burn agriculture and speak a language that is very different than that of the lowland Burmese. 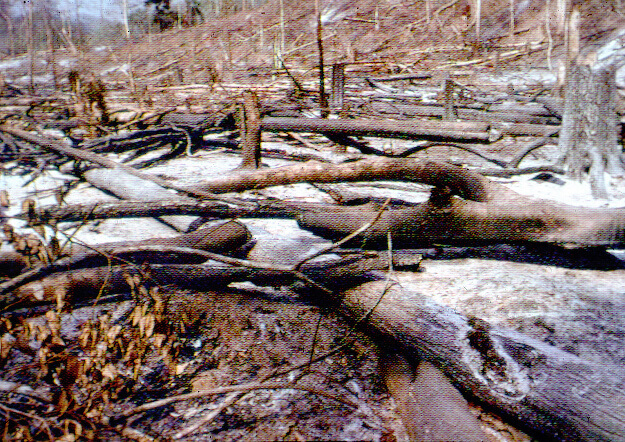 The practice of slash-and-burn agriculture consists of burning the forests and then using the ashes from the burnt timber as fertilizer for the fields. 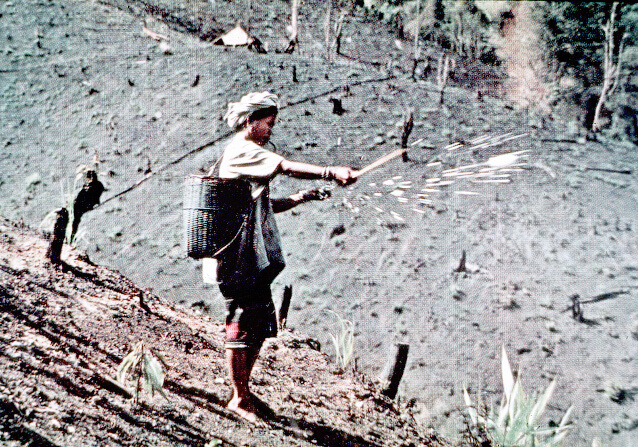 The fertilizer lasts for only several years, never more than six, and at that time the Karen must pack and move everything to a new site where a different section of the forest is burned. A number of hillside groups practice slash-and-burn agriculture and periodically move through each other's hereditary territory to new lands. These people move back and forth across the Thai border with little regard for the national boundary. Slash-and-burn agriculture is perilous in that after the forest is burned, seeds must be planted and then rains must occur quickly and consistently until the plants are well established. If this does not happen, the plants will wither and die or insects and animals will eat the seeds. It is not unusual for the Karen to be forced to plant four times in order to reap a single harvest. For the Karen, the bronze drums perform a vital service in inducing the spirits to bring the rains. When there is a drought, the Karens take the drums into the fields where they are played to make the frogs croak because the Karens believe that if the frogs croak, it is sign that rain will surely fall. Therefore, the drums are also known as "Karen Rain Drums"
Bronze drums were used among the Karen as a device to assure prosperity by inducing the spirits to bring rain, by taking the spirit of the dead into the after-fife and by assembling groups including the ancestor spirits for funerals, marriages and house-entering ceremonies. The drums were used to entice the spirits of the ancestors to attend important occasions and during some rituals the drums were the loci or seat of the spirit. It appears that the oldest use of the drums by the Karen was to accompany the protracted funeral rituals performed for important individuals. The drums were played during the various funeral events and then, among some groups, small bits of the drum were cut away and placed in the hand of the deceased to accompany the spirit into the afterlife. It appears that the drums were never used as containers for secondary burial because there is no instance where Type III drums have been unearthed or found with human remains inside. The drums are considered so potent and powerful that they would disrupt the daily activities of a household so when not in use, they were placed in the forest or in caves, away from human habitation. They were also kept in rice barns where when turned upside down they became containers for seed rice; a practice that was thought to improve the fertility of the rice. Also, since the drums are made of bronze, they helped to deter predations by scavengers such as rats or mice. When played, the drums were strung up by a cord to a tree limb or a house beam so that the tympanum hung at approximately a forty-five degree angle. The musician placed his big toe in the lower set of lugs to stabilize the drum while striking the tympanum with a padded mallet. Three different tones may be produced if the tympanum is struck at the center, edge, and midpoint. The cylinder was also struck but with long strips of stiff bamboo that produces a sound like a snare drum. The drums were not tuned to a single scale but had individualized sounds, hence they could be used effectively as a signal to summon a specific group to assemble. It is said that a good drum when struck could be heard for up to ten miles in the mountains. The drums were played continuously for long periods of time since the Karen believe that the tonal quality of a drum cannot be properly judged until it is played for several hours. The drums were a form of currency that could be traded for slaves, goods or services and were often used in marriage exchanges. They were also a symbol of status, and no Karen could be considered wealthy without one. By the late nineteenth century, some important families owned as many as thirty. The failure to return a borrowed drum often led to internecine disputes among the Karen. Although the drums were cast primarily for use by groups of non-Buddhist hill people, they were used by the Buddhist kings of Burma and Thailand as musical instruments to be played at court and as appropriate gifts to Buddhist temples and monasteries. The first known record of the Karen drum in Burma is found in an inscription of the Mon king Manuha at Thaton, dated 1056 AD. The word for drum in this inscription occurs in a list of musical instruments played at court and is the compound pham klo: pham is Mon while klo is Karen. The ritual use of Karen drums in lowland royal courts and monasteries continued during the centuries that followed and is an important instance of inversion of the direction in which cultural influences usually flow from the lowlands to the hills. The town of Nwe Daung, 15 km south of Loikaw, capital of Kayah (formerly Karenni) State, is the only recorded casting site in Burma. Shan craftsmen made drums there for the Karens from approximately 1820 until the town burned in 1889. Karen drums were cast by the lost wax technique; a characteritic that sets them apart from the other bronze drum types that were made with moulds. A five metal formula was used to create the alloy consisting of copper, tin, zinc, silver and gold. Most of the material in the drums is tin and copper with only traces of silver and gold. The Karen made several attempts in the first quarter of the twentieth century to revive the casting of drums but none were successful. During the late 19th century, non-Karen hill people, attracted to the area by the prospect of work with British teak loggers, bought large numbers of Karen drums and transported them to Thailand and Laos. Consequently, their owners frequently incorrectly identify their drums as being indigenous to these countries. F. Heger, Alte Metalltromeln aus Sudest-Asie (Leipzig, 1902). H. I. Marshall, The Karen People of Burma: A Study in Anthropology and Ethnology (Columbus, 1922). 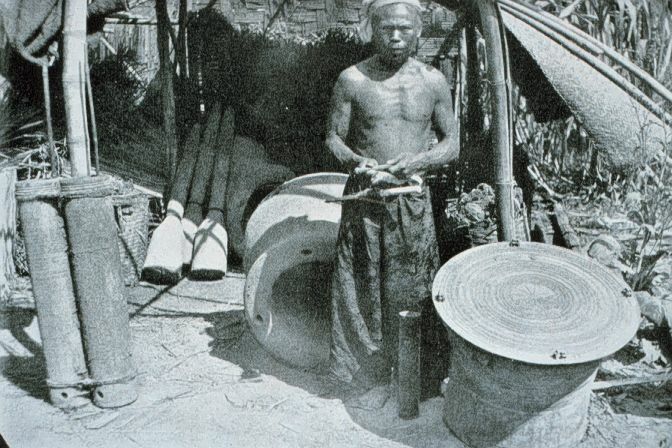 H. I. Marshall, "Karen Bronze Drums", Journal of the Burma Research Society, xix (1929), pp. 1-14. Richard M. Cooler, "The Use of Karen Bronze Drums in the Royal Courts and Buddhist Temples of Burma and Thailand: A Continuing Mon Tradition? ", Papers from a Conference on Thai Studies in Honor of William J. Gedney (Michigan Papers on South and Southeast Asia, No 25, Ann Arbor, 1986) pp. 107-20. Richard M. Cooler, The Karen Bronze Drums of Burma: Types, Iconography, Manufacture, and Use (Leiden, 1994).